News Flash: Don't Eat Your Snowshoes. A first grader learned something he will never forget during our weather class today. Oh I'm sure he learned about weather patterns, seasons being caused by axial tilt and even the water cycle but something tells me that's not the lesson he'll remember. Part of the class involved going out to snowshoe to enjoy our fine Minnesota weather. Today that would be a light snow and a temperature of 10° F . At the end of the hike, the kids took of their metal snowshoes which they had tromped through the cold snow for 30 minutes. The salient lesson here has to do with thermal conductance of metals. The rims of the snowshoes were a good 23° below freezing. The first graders mouth was both much warmer and wetter. Do you see where I'm going here? He decided for some crazy reason only known to a first grade brain to put the metal rim of the snowshoe in his mouth. Of course, the metal very quickly, i.e. almost instantly, conducted away all of the heat in his saliva and froze his mouth to the metal rim of the snowshoe. This is actually pretty easily remedied with some warm water but in a panic the boy forcefully yanked the snowshoe out of his mouth and the bleeding ensued. 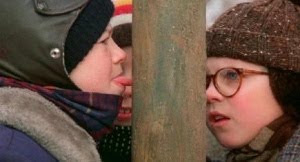 So, though you might not think such things need to be said out loud, we should probably now tell the first graders not to lick their snowshoes. You should have kept the wooden snow shoes. Darn that new fangled technology.